Most children would love to have a robot to do their chores, like cleaning their room. WowWee, makers of all sorts of cool toy robots and other electronics, has granted this wish with the Roboscooper, which is able to pick up things in a child’s room automatically. Granted, the items have to weigh one ounce, and it can only store what it fits in the back. It doesn’t look like it can clench its fingers, but designed for a mechanical hug. WALL-E it isn’t, but this isn’t about collecting garbage and compressing it into a cube. However, if this WowWee Roboscooper did work as well as its Pixar counterpart, then it could make kids and their parents lazy. Then we’ll just leave the robots to do the cleaning while we sit around and get fatter and fatter. I suppose it is a WALL-E world after all. The Roboscooper can do more than just pick up things. In fact, it can be reprogrammed to slap things out of the way instead of picking them up. I wonder if there is a weight limit on that. 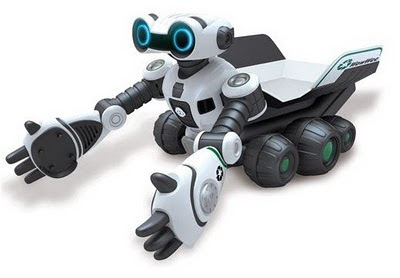 You can pre-order this particular toy/cleaning robot from WowWee now. It will ship at the end of this month, and cost about $70. It will require 6 AAA batteries for operation.